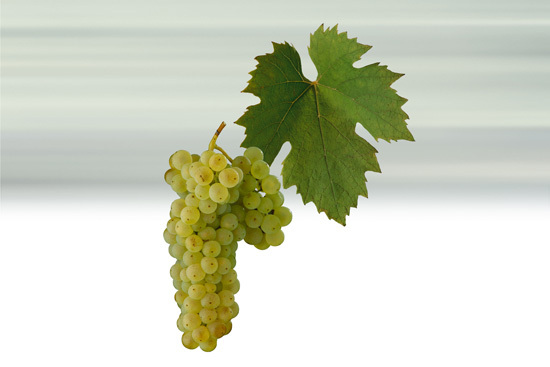 The origins of the Welschriesling or Laski Rizlink are obscure, though it has no relationship whatsoever with the noble (Rhine) Riesling itself. Its prefix, though, in most languages, actually means "foreign". It is most grown in south-eastern Europe, northern Italy, Hungary, Austria, Slovakia and Czech Republic, where it is called Ryzlink vlašský. In Austria it goes under the name Welschriesling, in Hungary Olaszrizling, in the Balkans its name is Laski or Laški Rizlink as well as Rizling Italijanski, while Italians refer to it as Riesling Italico. It is of medium growth and moderate foliage with sharply serrated medium-sized leaves of a rather light appearance. The wood matures well and the bark has a golden hue. Bunches are oval with, on occasion, smaller, sub-bunches appended from the base of the long stalks. Berries are small, round, yellowish-green, with black spots on the top. Skins are at the same time weak and firm, the flesh juicy with pervading acidity. It is a vine very resistant to frosts while its resistance to fungal diseases is only moderate. Its stems suffer from drying out. Grape ripening is very late. The wines are distinguished by higher acidity levels which may be steely. In vintages when the grapes are fully ripe and the yields controlled, they have a piquant freshness. Those wines possessing higher quality attributes have a pleasing character and are harmonious, especially when they have a high residual-sugar content. Wines from this grape variety cover the entire quality spectrum for white wine, starting with simple wines ideal to be served with light and plain dishes. Then there are the light quality wines which display tones of redcurrants and gooseberries on the nose and, when coming from calcareous soils, bunches of meadow flowers. Finally we come to the delicate, honey-toned, mature, special-selection wines evoking grapey aromas and sultanas with refreshingly zesty notes of soft botrytis fruit. Welschriesling always provides pleasing raw material for the production of sparkling wines and is an ever-important ingredient in all possible types of blended brand-named wines in which they form the backbone of the cuvée, without which the resulting wine would be dull and boring to say the least. Greenish-yellow color, in youthful wines fruity blackcurrant tones predominate, sometimes gooseberry, later the scent of meadow flowers. These combine with a piquant acidity and medium body to give a refreshing roundness which makes them pleasantly quaffable. In wines made from less ripe grapes the acidity and steeliness are generally harder.